British student Eleanor Haswell has created a graphic underwear set depicting the internal female anatomy as a feminist art project to highlight society's problems with body image, body shaming and domestic violence. 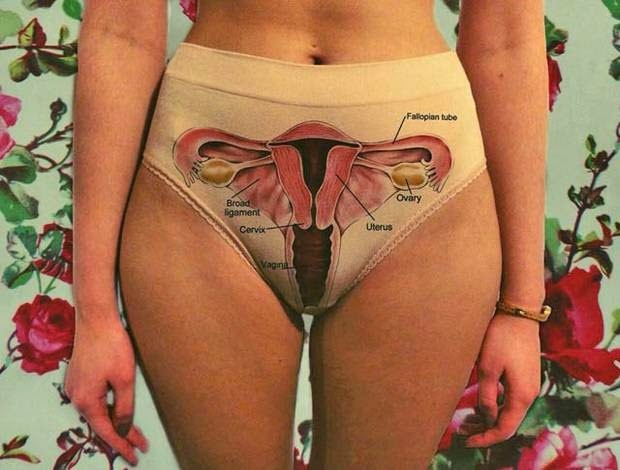 The 18-year-old art student from north-east England is on a mission to make women stand up and take notice of their own bodies and came up with her anatomically correct undies for her project Why Are You So Afraid Of Your Own Anatomy?. The matching bra and pants set could teach the world a biology lesson on women’s intimate parts – a graphic insight into breasts and vaginas. However, Haswell’s unique set is not for sale as it’s solely a piece of art. “There's been a lot of people requesting for me to sell them, but my intentions weren't to market the underwear,” she told The Independent. Other work involves images of a woman’s underarm covered in rose thorns to highlight the “narrow-minded views” towards women’s body hair. “It is beyond me why people still feel that they have to pressure women into removing all body hair to be deemed attractive,” she said. Eleanor Haswell 's work is available to see on Clandestine Collective.